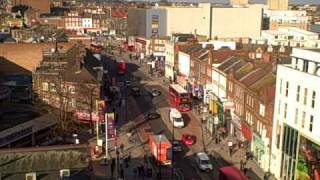 N 51° 35' 59" and W -0° 7' 0"
Wood Green in Greater London (England) is a town in United Kingdom a little north of London, the country's capital city. Current time in Wood Green is now 08:39 AM (Sunday). The local timezone is named Europe / London with an UTC offset of one hour. We know of 8 airports near Wood Green, of which 5 are larger airports. The closest airport in United Kingdom is London City Airport in a distance of 10 mi (or 16 km), South-East. Besides the airports, there are other travel options available (check left side). There are several Unesco world heritage sites nearby. The closest heritage site in United Kingdom is Tower of London in a distance of 10 mi (or 17 km), South-East. Also, if you like playing golf, there are a few options in driving distance. We discovered 3 points of interest in the vicinity of this place. Looking for a place to stay? we compiled a list of available hotels close to the map centre further down the page. 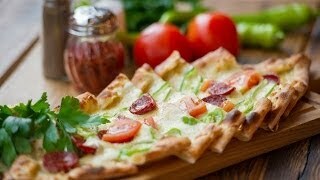 When in this area, you might want to pay a visit to some of the following locations: Enfield Town, Camden Town, Islington, Hackney and City of London. To further explore this place, just scroll down and browse the available info. Let's start with some photos from the area. 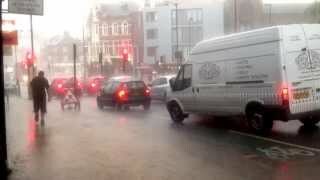 Just after 5pm on 25th July 2014 in Wood Green, London, England, UK. View of Wood Green. 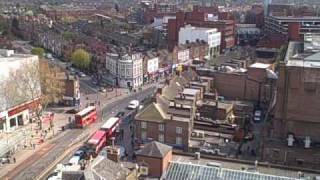 Great shot high above the streets of Wood Green and Turnpike Lane. 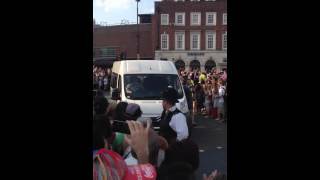 Olympic Torch travells through Wood Green, London. UK 25th-July-2012. 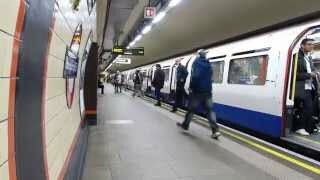 A Piccadilly Line tube arrives and departs Bounds Green station during the evening of Friday 17 October 2014. 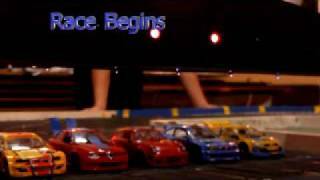 Some clips of a touring car race at the London Scalextric Club Wood Green. Come along on a Tuesday night and give it a try, First Evening FREE. 8.30 till 11.00. Turnpike Lane is the name of a street in Haringey, north London. The road is characterised by independent retailers with flats above their shops. It is also a local transport hub, with Turnpike Lane tube station and a major bus station situated near the eastern end of the street. Located at 51.5896, -0.10639 (Lat. / Lng. ), about 1 miles away. The London Borough of Haringey Listen/ˈhærɪŋɡeɪ/ is a London borough, in North London, classified by some definitions as part of Inner London, and by others as part of Outer London. It was created in 1965 by the amalgamation of three former boroughs. It shares borders with six other London boroughs. Clockwise from the north, they are: Enfield, Waltham Forest, Hackney, Islington, Camden, and Barnet. Haringey covers an area of more than 11 square miles . Located at 51.6016, -0.112915 (Lat. / Lng. ), about 0 miles away. Alexandra Palace is a building in North London, England. It stands in Alexandra Park, in an area between Hornsey, Muswell Hill and Wood Green. It was built in 1873 as a public centre of recreation, education and entertainment and as North London's counterpart to the Crystal Palace in South London. Designed to be "The People’s Palace" and later nicknamed "Ally Pally", in 1936 it became the headquarters of the world's first regular public "high-definition" television service, operated by the BBC. Located at 51.5939, -0.13 (Lat. / Lng. ), about 1 miles away. 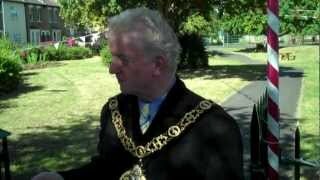 Alexandra Park is an 80 hectare, Green Flag Award and Green Heritage winning landscaped park in the Borough of Haringey in north London. Located at 51.5957, -0.12603 (Lat. / Lng. ), about 0 miles away. Arqiva is a telecommunications company which provides infrastructure and broadcast transmission facilities in the United Kingdom and Republic of Ireland. The present company, with headquarters located at Crawley Court in the village of Crawley, Hampshire, was formed by National Grid Wireless combining with Arqiva in September 2008. Its main customers are broadcasters and mobile phone network operators, and its main asset is a network of over 1,000 radio and television transmission sites. Located at 51.5944, -0.129167 (Lat. / Lng. ), about 1 miles away. Southern Studios is a recording studio in the Wood Green area of London. It was founded in 1974 by John Loder, and came to be the recording studio of choice for Crass and their record label Crass Records. Southern Studios Ltd. continues to grow its label and provide label management and distribution services throughout Europe. Located at 51.6064, -0.112222 (Lat. / Lng. ), about 0 miles away. The Alexandra Palace television station in North London is one of the oldest television transmission sites in the world. What was at the time called "high definition" TV broadcasts on VHF were beamed from this mast from 1936 until the outbreak of World War II. It then lay dormant until it was used very successfully to foil the German Y-Gerät radio navigation system during the last stages of the Battle of Britain. Wood Green was a local government district in south east Middlesex from 1888 to 1965. Until 1888 Wood Green was part of Tottenham, and was included in the district of the Tottenham Local Board in 1850. Pressure from residents of the area led to the passing of the Tottenham Local Board (Division of District) Act 1888, constituting a separate local board for the area. In 1894, under the local Government Act of that year, Wood Green became an urban district. Located at 51.6, -0.116667 (Lat. / Lng. ), about 0 miles away. Southgate was a local government district of Middlesex from 1881 to 1965. It was part of the London postal district and Metropolitan Police District. The area was historically part of the parish of Edmonton, which adopted the Public Health Act 1848 and formed a local board of health to govern the area in 1850. In 1879 the ratepayers of Southgate petitioned for their area to be separated from Edmonton, and in 1881 Southgate Local Board was established, with nine members. Located at 51.6155, -0.1106 (Lat. / Lng. ), about 1 miles away. Noel Park and Wood Green is a closed railway station on the Palace Gates Line in Wood Green, north London. It was located on the north-east side of The Broadway adjacent to Pelham Road. Its site is now occupied by Wood Green Shopping City. The station was opened on 1 January 1878 as Green Lanes by the Great Eastern Railway as the temporary terminus of the line which was extended to Palace Gates (Wood Green) station on 7 October 1878. Located at 51.5954, -0.10727 (Lat. / Lng. ), about 1 miles away. Palace Gates railway station was on the Palace Gates Line in Wood Green, north London, on the corner of Bridge Road and Dorset Road. It was opened on 7 October 1878 by the Great Eastern Railway (GER) as terminus of the line that bore its name. The line had terminated at the previous station, Noel Park and Wood Green, since opening on 1 January 1878. The station was opened to provide a means by which the GER could transport passengers to the nearby Alexandra Palace. Located at 51.5995, -0.1191 (Lat. / Lng. ), about 0 miles away. The A105 road is an A road in London, England. It runs from Canonbury, in between Highbury and Dalston, to Enfield Town. The road is 8 miles long. Part of the road forms Green Lanes, one of the longest streets in London, while the A105 also serves as the primary access route to the Shopping City shopping centre. The road originally continued north from Enfield Town through Forty Hill and Bulls Cross, crossing the A10 to the A1010 at Bullsmoor to the south of Waltham Cross. Located at 51.5987, -0.1109 (Lat. / Lng. ), about 0 miles away. Hornsey was an ancient parish in the county of Middlesex. It was both a civil parish, used for administrative purposes, and an ecclesiastical parish of the Church of England. Located at 51.5871, -0.12195 (Lat. / Lng. ), about 1 miles away. Lordship Lane connects Wood Green (N22) with Tottenham High Road (N17). It lies in the London Borough of Haringey and forms part of the A109 road. Located at 51.5972, -0.109724 (Lat. / Lng. ), about 0 miles away. The Wood Green ricin plot was a 2002 alleged bioterrorism plot to attack the London Underground with ricin poison. The planned attack had connections with al-Qaeda. The Metropolitan Police Service arrested six suspects on 5 January 2003, with one more arrested two days later. Within two days, the Biological Weapon Identification Group at the Defence Science and Technology Laboratory in Porton Down were sure that there was no trace of ricin on any of the articles that were found. Located at 51.6081, -0.110278 (Lat. / Lng. ), about 1 miles away. Bounds Green TMD is situated in North London. The depot is operated by East Coast. The depot code is BN. Located at 51.601, -0.12218 (Lat. / Lng. ), about 0 miles away. Hornsey Electric Multiple Unit Depot (EMUD) is a railway maintenance depot for First Capital Connect's Great Northern fleet of electric multiple units, as well as carrying out those maintenance tasks on FCC's Thameslink Class 319 and 377 units which Bedford Cauldwell depot is unable to do. Situated in Hornsey, London, England, to the south of Hornsey Station on the East Coast Main Line, the depot code is HE. Located at 51.5843, -0.10982 (Lat. / Lng. ), about 1 miles away. The A109 is an A road in North London, England. It runs from Oakleigh Park to Tottenham and for the most part is parallel to the North Circular Road. Located at 51.6092, -0.12922 (Lat. / Lng. ), about 1 miles away. White Hart Lane Community Sports Centre, also known as the New River Stadium, is a rugby league and athletics stadium in Wood Green, Haringey, North London, England that is home to the London Skolars rugby league club, Haringey & Enfield Athletics Club, Wood Green Weightlifting Club, Haringey Rhinos rugby union club and Haringey Cycling Club. The New River Stadium also hosts the Middlesex 9s rugby league nines tournament. Located at 51.605, -0.100556 (Lat. / Lng. ), about 1 miles away. Broomfield House is a building of historical interest located in Broomfield Park, Palmers Green, North London. Built during the 16th Century, it was damaged by fires in 1984 and 1994, and is currently awaiting restoration as part of the English Heritage Restoration Programme. Located at 51.6176, -0.1172 (Lat. / Lng. ), about 1 miles away. 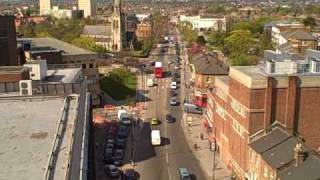 The Mall Wood Green is a large shopping centre and residential complex in Wood Green, North London. It is generally still referred to by its former name of Wood Green Shopping City; the signage on the building still uses that name. The Mall is the largest shopping centre within the North Circular, with just over 100 retail shops, seven of them anchor stores, 45 market stalls, and an average of 221,000 customers per week. Located at 51.5945, -0.1084 (Lat. / Lng. ), about 1 miles away. London Turkish Radio (LTR) is a Turkish radio station broadcasting to London on 1584 kHz AM specialising in music, news, and politics. Located at 51.5952, -0.109167 (Lat. / Lng. ), about 0 miles away. Wood Green Animal Shelters is an English animal welfare charity. The charity was founded in 1924 as a response to the number of animals abandoned on London's streets. There are three shelters: 601, Lordship Lane, Wood Green, North London Heydon, on the Hertfordshire / Cambridgeshire border Godmanchester - the headquarters The shelter rehomes a variety of animals including dogs, cats, field animals such as goats and horses, and small animals such as rabbits, ferrets and guinea pigs. Located at 51.5991, -0.101564 (Lat. / Lng. ), about 1 miles away. Konk is the name of a recording studio and record label, established and managed by members of British Rock group The Kinks. Located at 51.5854, -0.11473 (Lat. / Lng. ), about 1 miles away. Priory Park is a 6.5-hectare public park in Hornsey in the London Borough of Haringey. It is located on the Priory Road and Middle Lane, approximately 0.5km north of Crouch End Broadway. It has been winner of multiple Green Flag Award since 2003, and has an active community group. The park contains a fountain made from Lamorna stone which was installed in 1909. This originally stood in St Paul's Cathedral churchyard. Located at 51.585, -0.125 (Lat. / Lng. ), about 1 miles away. These are some bigger and more relevant cities in the wider vivinity of Wood Green.